As they were introduced, I recalled my first encounter with these men. I was as a senior at the State University of New York at Plattsburgh majoring in Communications/Journalism and was excited about the Olympic games that were being held thirty miles away. The college closed to give its students an opportunity to work at the event. I applied for a job and received my assignment, a volunteer at the Olympic press office. My first official position as a writer. I was thrilled, convinced that I’d be networking with reporters from the New York Times and ABC. That my career would be launched. Yes, I do tend to dream large. Pop! The dream busted. I spent my first few days on the job sitting on the sidelines in a huge room with typewriters (no computers back then) waiting for a reporter in the near empty room to request something like a ham sandwich or a cup of coffee. I didn’t even get a request for a pencil. Disappointed and bored, I signed out and didn’t return. I wouldn’t be missed. There were several other unoccupied gophers mulling around and I had a pass allowing me access to outside events that needed to be used. All was not lost. After all, the Olympics were in town. I went to outdoor competitions and strolled around the village with friends until the last bus of the night drove us back to campus. On February 22 I was in a pub with an apathetic crowd preparing to watch the U.S. Hockey Team get creamed by the Soviet Union. Not a single sports column or commentator predicted a win against the powerhouse from Russia. At best, they’d have a respectful loss. However, the young skaters from various colleges around America had a different plan. It didn’t take long for spectators in the packed bar to forget about their beer and cheer for the little team that could. They were on fire. No spoilers here. We all know what happened. The U.S. Team shocked the world and won, 4-to-3. With that victory, they created a treasured story. That the combination of preparation, conviction, camaraderie, courage, and faith is a winning formula. That if you believe in yourself it might just result in a miracle. They showed a young writer that she shouldn’t give up because her first assignment was a dud; to keep dreaming big. 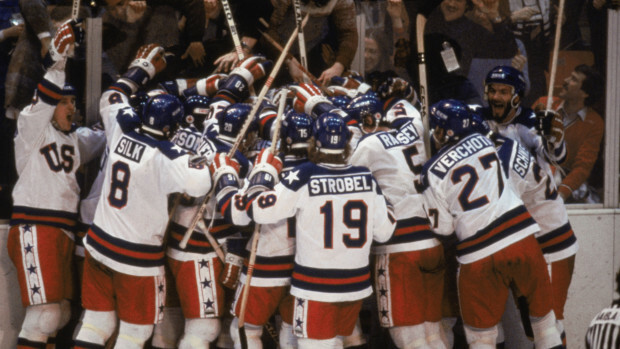 The U.S. Hockey Team celebrate after their Olympic victory over The Soviet Union in 1980. That’s the main reason I returned in 2015. I wanted to hear the story again from the authors themselves, and I did. They were interviewed on stage by Todd Walsh of FOX Sports Arizona. They joked around and laughed. They reminisced and reflected. They revealed how they felt in the midst of that momentous game. Mark Pavelich was asked what he was thinking when he shot the puck to Team Captain, Mike Eruzione who made the winning goal. Pavelich stood and in jest indicated that the shot could’ve been his, but he decided to give the glory to his teammate. 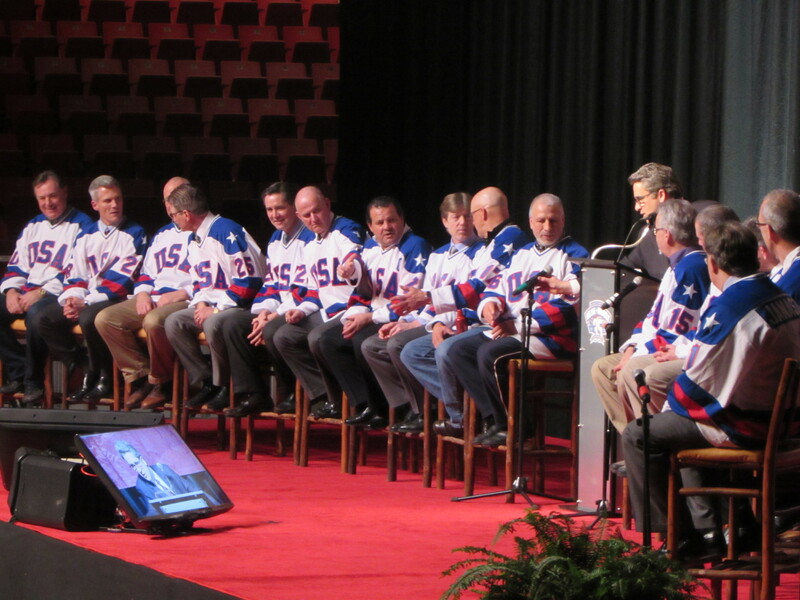 Eruzione was ready with a comeback and the audience was clearly amused by their banter. Goaltender, Jim Craig, was asked what it was like to keep the puck out of his net for the last ten minutes of the game. He graciously said that his account had been recorded on several occasions and passed the microphone down the line to some of the less celebrated team members. Mark Pavelich gives his perspective about the winning goal. Mike Eruzione tells his version of how the puck landed in the net. The obviously close-knit group watched the big win, re-cast on large screens, along with those in attendance. 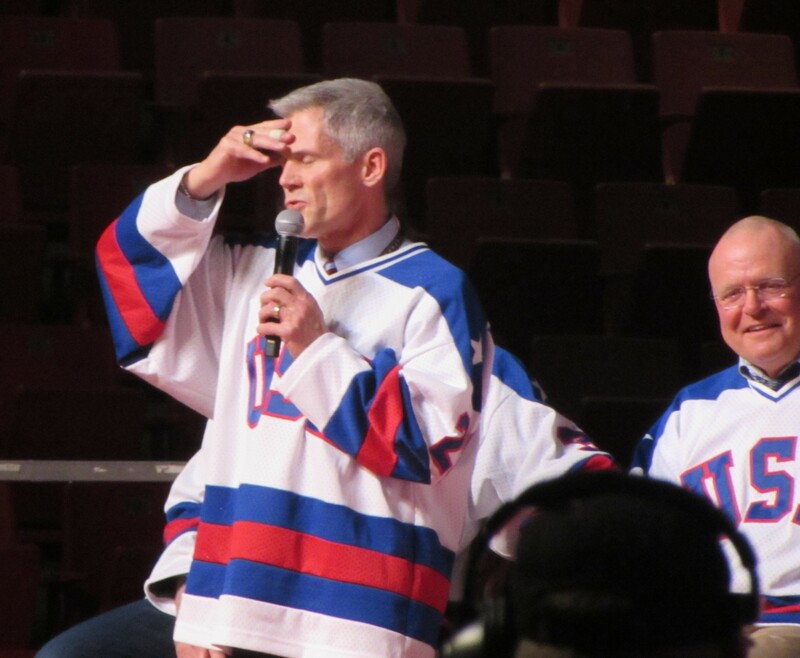 When the final buzzard sounded, the crowd rose and applauded while chanting those infamous three letters, “U.S.A., U.S.A., U.S.A.” The team looked at the full house with awe and gratitude. 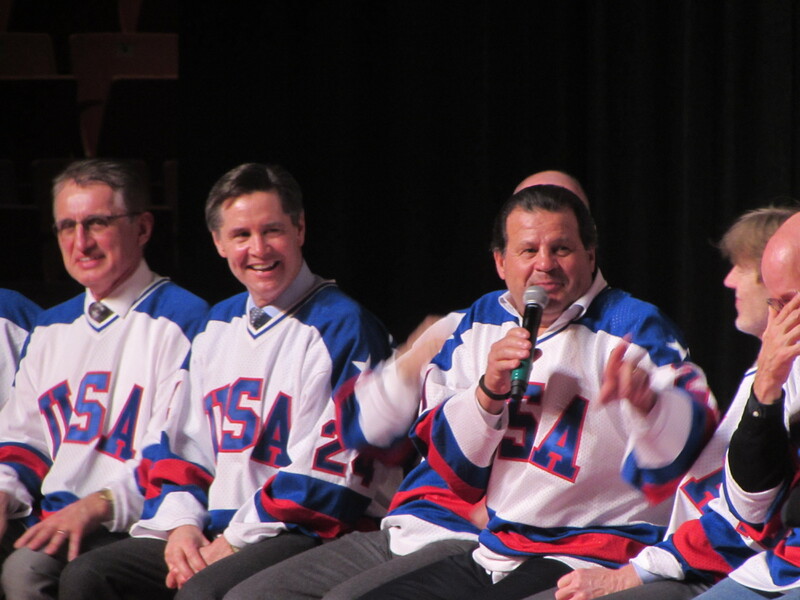 Mike Eruzione expressed how amazed he was that so many people came out to re-live the Miracle on Ice and was overwhelmed by the response. Two members of the team were missing. Bob Suter who passed away in 2014 and Coach Herb Brooks who was killed in a car accident in 2003. They were both recognized with heartfelt words throughout the evening. 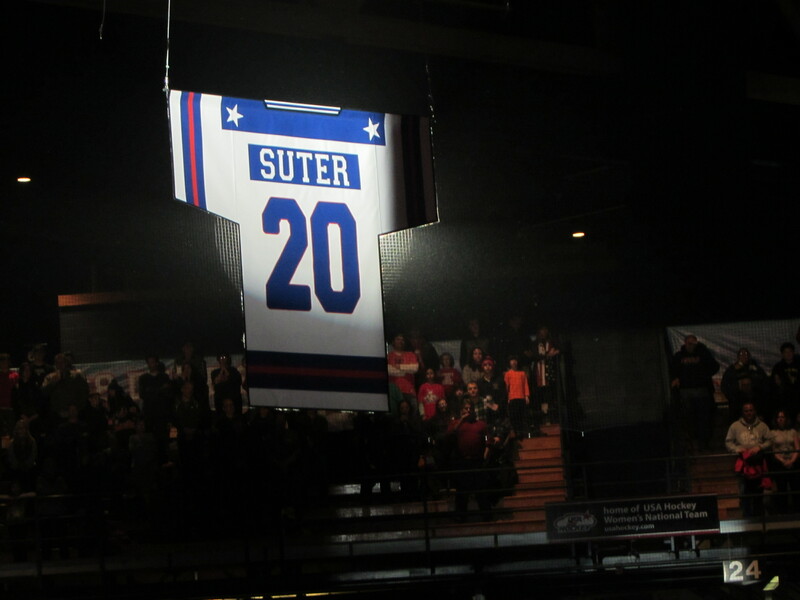 Suter’s jersey was raised while the Star Spangled Banner was played. 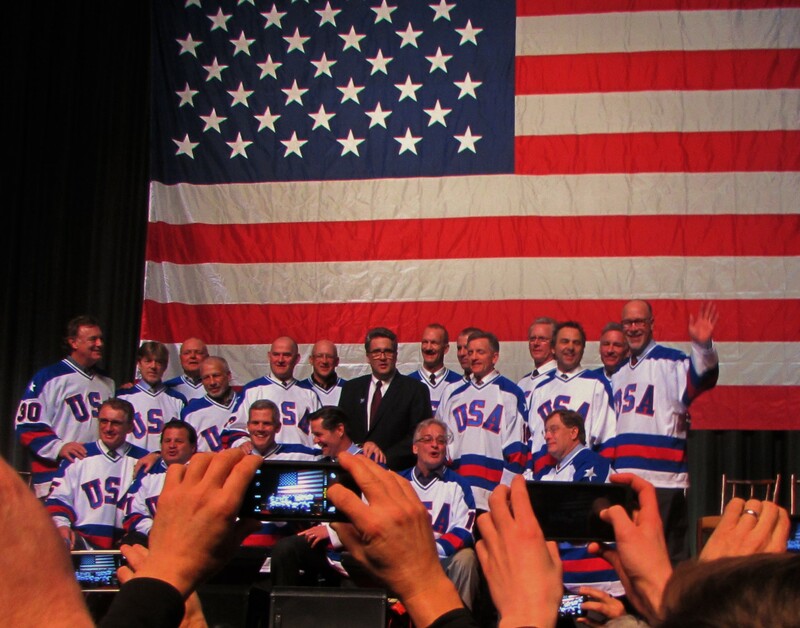 Coach Herb Brooks declared to the team in the locker room before the historic game, “You were born to be a player. You were meant to be here. This is your time. Now get out there and take it.” He will be permanently remembered now that the Lake Placid ice arena is named in his honor. The evening ended with picture-taking opportunities and autographs. The “Again” scene from the movie, Miracle on Ice with Kurt Russell as Herb Brooks. What do you think? 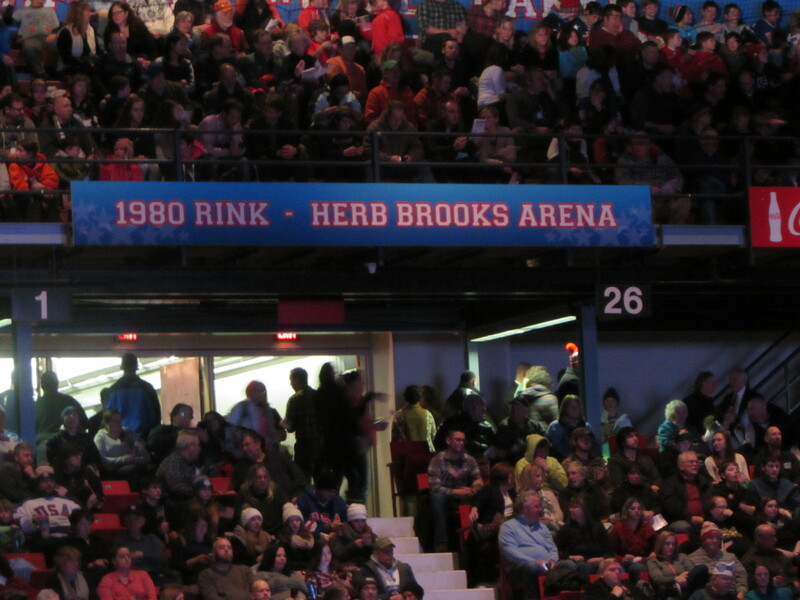 Categories: Uncategorized | Tags: Herb Brooks Ice Arena, Lake Placid, Miracle on Ice, Miracle on Ice 35th Anniversary, US Olympic Hockey Team | Permalink. I didnt Know you were there. You make it all so vivid. Really enjoyed this article!